being an ol timer I am not to clued up on this. 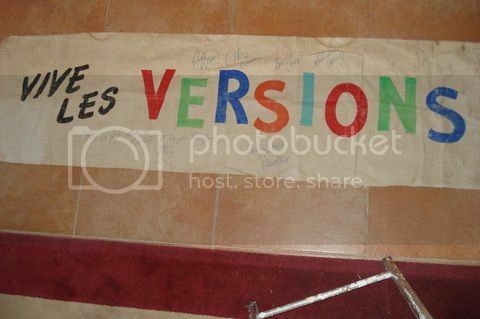 I am trying to put a picture of a banner on here of "THE VERSIONS"
and eventually the finals at the Palladium in London. I found the banner the other day it was carried by a young lady by the name of Elaine she worked in the office at Bawsey sandpits and Judy Boldero from Docking. I will send the banner to Docking Heritage group. Are the girls still around ????????? anyone remember the ballons floating down from the gods in the Palladium and the old boy an usher trying to stop us !!!!!! wish I was 27 again !!! I remember the Heacham and Docking dances, yes we called them dances in those days, now they talk of gigs! A gig is a long rowing boat used in Cornwall and the Isles of Scilly. I know there are gigs and giggs, but gigs indeed, I went dancing!! young lady by the name of Elaine she worked in the office at Bawsey sandpits and Judy Boldero from Docking. I found out last weekend while at the Docking heritage group exhibition that Judy Boldero sadly died earlier this year.